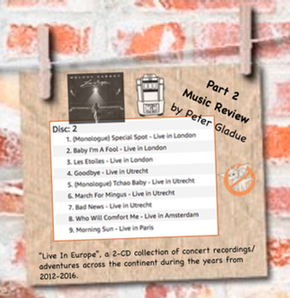 We posted part one of a fantastic review of Melody Gardot’s “Live In Europe”, a 2-CD collection of concert recordings/adventures across the continent during the years from 2012-2016. Here is the rest of Mr. Pete’s (Peter Gladue) take on this gift. Enjoy! “Goodbye” she has joked is about an old lover, I can imagine this song in a TCM ad or playing over the credits of some old film noir. She rolls out band introductions, (with jazzy solos) between choruses of the soul/gospel standard, “Nobody Fault But Mine.” This mix is also challenging to the listener, because the band starts showing off its chops. I gather a sense of mutual respect between the musicians, to these ears everybody on stage sounds like they’re enjoying themselves. We go a whisper to a quiet storm to a sonic blizzard. The performance is dramatic and fearless and I gather a sense of mutual respect between the musicians, to these ears everybody on stage sounds like they’re enjoying themselves. The song “Bad News” plays as blues strut and Gardot’s cry of the refrain “Closing Time”, sounds like they are worshipping at the alter of Tom Waits. Gardot howls and the sax player walks us out. Gardot revisits one of her early songs “Who Will Comfort Me”, not as a sad question of loneness as it was written. Now it’s a demanding blues rant, raising her/our voice to the heavens. The Audience joins in as if not asking “Who?” but rather “When?” The thunderous drum work pushes the song to it’s peak ending. We finish with “Morning Sun” recorded in Paris, her adopted city, though she considers herself a citizen of the world. This track is from her 2016 DVD/BluRay release. This last song is like the morning sunrise, warm with the promise of a new day, draining of the musical emotions that drench the night. Look upon this CD as a fine evening of entertainment from charming and entertaining musicians. This last song is like the morning sunrise, warm with the promise of a new day, draining of the musical emotions that drench the night… Leaving us curious about what the/our future bless us with. Thanks for reading / listening! We hope you enjoyed Mr. Pete’s review. We certainly did and look forward to more from him.